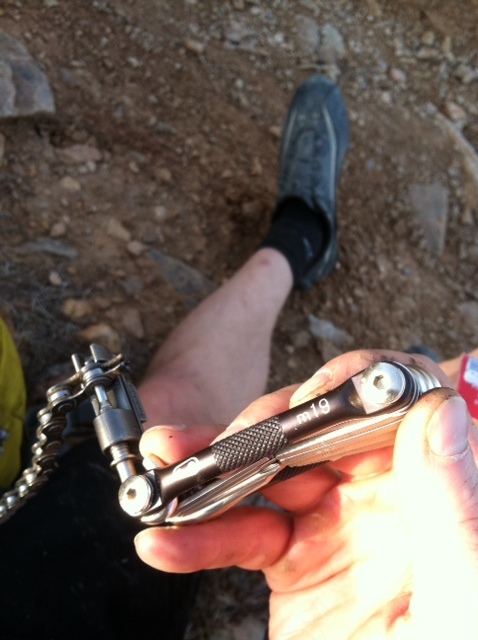 I was minutes from summiting Windgate, at record time... when my chain broke. Even though I *thought* I had a complete pack with everything I reasonably need - I didn't have a piece of chain, only master links. When my chain broke I needed a few pieces of chain to get it fixed. I was about ready to pack up and coast down windgate and push the bike back to the car. Maadjurguer comes rolling along, I think with Chollaball and presto change he had a section of chain he gladly gave me to help. Thanks dude! Salvaged my ride. Be cool people, it pays dividends. This is why Dog created single speeds. Why....so they can break down and get some trail magic from a full squisher rocking a 3x10? Yes the 9spd links worked great with the 8spd chain. I only cut off the extra Dixie Mine to Sonoran and up Sonoran section, extremely glad to get the bulk of the ride in considering the broken chain. Thanks again. What kind of multi tool is that you use? Mine don't have the chain tool on it so i have to carry one and it's heavy . Crank Bros M19, it rocks. That's a Crank Bros I believe. But be careful, those mothers come apart really, really easy. As a veteran SSer, I appreciate the sentiment, but Randy rides an SS. I used to put chains that had worn out on a geary on my SS - never broke one. 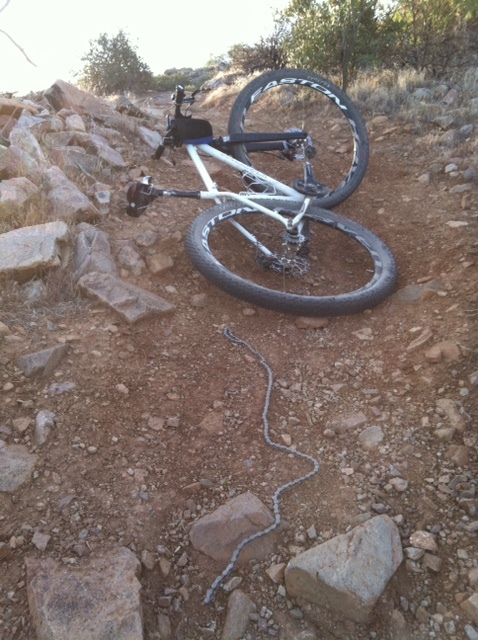 However, I broke a fairly new chain this past year. Sometimes it is just your turn. It is rather amusing to have Maad, with his fancy full suspension geared wonder bike have to come to the aid of a full rigid SSer. Rare, but amusing. And I actually have my Osprey very well packed with things I may need on a ride, adding some chain links to that list! Sadly I think Seron mentioned it with all his recent troubles - it never occurred to me that a few magic links wouldn't do the trick. When I put on a new chain tonight I'll stick the extra links in my pack for next time. As a veteran SSer, I appreciate the sentiment, but Randy rides an SS. I know. It's my pat answer for any bike that breaks down. I ALWAYS ride with about 3-4 inches of spare chain. ouch, kick a guy when he's down eh. LOL. Truth is I've been offered a killer deal on one of these, and it has me rethinking everything... I have so very much enjoyed rigid SS for the past couple thousand miles, but as I'm increased my mileage our rough trails have been beating me up. AND this offer is all shiny and new and looks purdy so it caught my eye. If you'd just get a suspension fork, I think you'd find life to be much more comfortable. I recently built up an old Niner frame with a rigid fork. While I love the way the bike handles with the steel fork, there is a huge difference in comfort between it and a suspension fork.